Awesome! I’m so glad you’re interested in the health of your pet! Me too! If I wasn’t living in France, I would be feeding my cat and my dog Life’s Abundance. They ate this for several years until I moved. I’m always looking for healthy food for them. There’s so much junk food on the shelves, and I want my pets to live long, healthy lives. 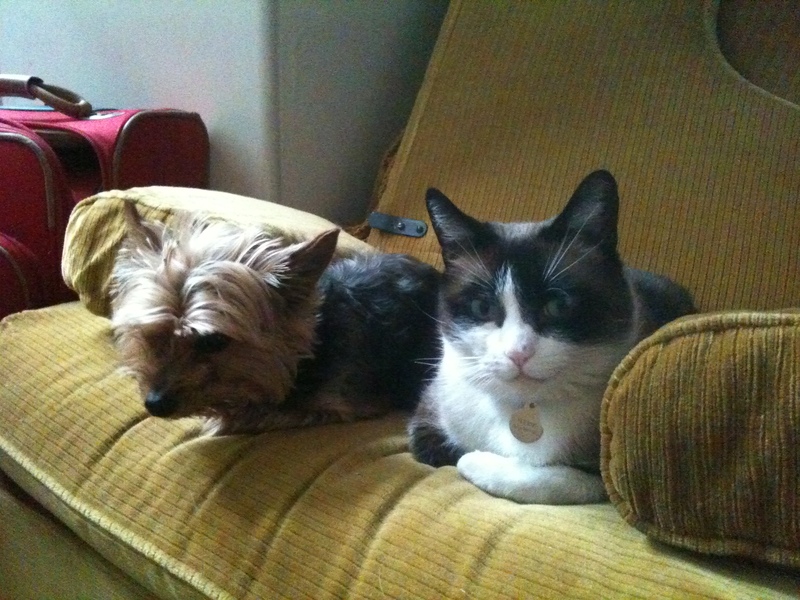 Right now my cat is 9 and my dog is 8, and she still bounces around like a puppy. So I’m going to tell you a little bit about the products by Life’s Abundance, and provide some links, and it would be awesome if you would check them out and maybe try it out. See if your cat or dog likes it. For healthy pet food, the prices aren’t bad, and they deliver to your home, saving you a trip to the pet store. You can put the deliveries on autoship as well, to come at regular intervals. It’s really great…. So here we go. Judging by its ingredients alone, Life’s Abundance appears to be an above-average dry dog food. The dashboard displays a dry matter protein reading of 29%, a fat level of 18% and estimated carbohydrates of about 45%. As a group, the brand features an average protein content of 30% and a mean fat level of 15%. Together, these figures suggest a carbohydrate content of 46% for the overall product line. Near-average protein. Near-average fat. And below-average carbs as compared to a typical dry dog food. Even when you consider the protein-boosting effect of the brewers yeast, this looks like the profile of a kibble containing a moderate amount of meat. What’s more, due to its unusually high meat protein content, Life’s Abundance Weight Loss Formula offers one of the best designs of its type we’ve reviewed to date. Life’s Abundance is a grain-based dry dog food using a moderate amount of chicken meal as its main source of animal protein, thus earning the brand 4 stars. Life’s Abundance canned dog food rates even higher, at 5/5 stars! Judging by its ingredients alone, Life’s Abundance appears to be an above-average canned dog food. The dashboard displays a dry matter protein reading of 45%, a fat level of 20% and estimated carbohydrates of about 27%. As a group, the brand features an average protein content of 45% and a mean fat level of 20%. Together, these figures suggest a carbohydrate content of 27% for the overall product line. Above-average protein. Below-average fat. And near-average carbs when compared to a typical canned dog food. With no sign of any plant-based protein boosters, this looks like the profile of a wet food containing a significant amount of meat. Life’s Abundance Dog Food is a meat-based canned product using a significant amount of poultry and seafood as its main sources of animal protein, thus earning the brand 5 stars. • Created a breakfast and Dinner to stress the fact that these are really nutritional meals. • Small dogs could eat the canned exclusively. • Dogs need water in canned food for healthy urinary tract + many feed or top off with canned foods that don’t offer good nutrition. Because your dog has unique nutritional needs that sometimes food alone cannot satisfy, Life’s Abundance offers supplements. This is an inexpensive way to bridge the gap between average and optimal health for your dog! • Chicken cartilage = glucosamine + chondroitin sulfate – 90% of older cats have arthritis. • Daily supplement important to add nutrients to the cats diet. • Regarding the nutrients in whole foods, the body takes what it needs and discards the rest. This is called selective absorption. • Whole foods have nutritional benefits you cannot find in a pill. • Whole foods are complex, meaning they contain a variety of nutrients. Speaking of treats…. if you’re going to give your dog treats, why give him junk food treats, full of calories and empty of nutrition? Treats can taste good AND be nutritious. Life’s Abundance makes doggy snack bars for when your dog needs a little snack. • Antioxidants are crucial for our pets to fight off toxins, bacteria, UV light, etc. • Antioxidants in the form of fruits and vegetables – apples, broccoli, parsley, carrots, thyme, peas, pomegranate. • Added antioxidants, Vitamin E and C.
• Peanut butter – tastes great. • Easy to break off pieces – can put in pocket and it does not crumble. I’m sure you know that healthy teeth and gums are an important part in your dog’s overall health, right? Right?! If you perhaps don’t brush his teeth regularly or just want some extra help, some dental treats may be what you want. How often do you see your cat grooming? How would you like to help him out, keeping that coat strong and resilient? These tasty treats may help. And he may thank you for less hairballs. • Probiotics, glycerin and natural fiber support the digestive system. • Proteins, flaxseed meal, omega-3 fatty acids and vitamins E and C all contribute to skin and coat health. • Savory nuggets are feline-friendly, and they feature a deliciously appetizing flavor that the most finicky cats love. • The additional protein, healthy fats and nutrients help keep the skin healthy. • Healthy skin produces strong, resilient coat. • Stronger coat means less hair is swallowed. • Healthy digestive system means any ingested hair moes through the GI tract. When you’re training your dog, it’s important to get his attention. Instead of using junk food treats, try something good for him (because he may need quite a few to get that trick right). The perfect size for training, they have an irresistible flavor and contain wholesome ingredients. • A wholesome, high-protein treat for your dog – all natural. • Made according to trainer recommendations – small pieces and an irresistible aroma dogs go crazy for. • Contains lamb and chicken from New Zealand. • Made in small batches only. • Small pieces make it a great treat for training or for small dogs or puppies. Still more treats! These are 100% pork skin and a much healthier alternative to rawhide. • 100% pork skin, high-protein treat. • Chewing action cleans teeth and gums. • Healthy alternative to rawhide. • Hours and hours of chewing pleasure. • Keeps dogs and puppies happily occupied. If you’re going to buy a chew toy, why not make it something that’s healthy, rather than a rope bone? Porky Puffs are hickory smoked, and made with 100% pork, so you won’t have to deal with the worries associated with feeding rawhide treats. The chewing action is great for teeth and gums! • Hickory smoked pork treats. • Naturally high in protein. • Safe alternative to rawhide. • Great for teeth and gums. • Keeps your dog busy. • Low-fat means less weight gain. If you are looking for a shampoo that will not only eliminate odors, but will make your pet’s coat shine, try Revitalizing Shampoo. Bath Fresh Mist is the perfect product to use in-between baths. It has a special ingredient that neutralizes odors instead of covering them up. The organic herbal extracts and other ingredients will help to revitalize the skin and coat, too. • Revitalizes coat for a lustrous shine. • Smells clean and fresh. • Bath Fresh Mist is a quick way to freshen. • A spray containing Zinc and herbs to soothe the skin. • Great for areas where your pet is licking excessively. • Penetrates the skin easily. • Soothes, especially during allergy season. Hartville Pet Health Insurance is an “A” rated underwriter, licensed in all 50 States and the district of Columbia. Harville was founded in 1997 and they are America’s fastest-growing pet health insurer. Get an instant quote by clicking above. Click above to subscribe to the Life’s Abundance newsletter, where you can learn more about the company and the products before making a decision. But, um, don’t forget to use my links, please. 😉 Help support my creative habits! Interested in Becoming a Rep? And why should you be? Because you can run your business from practically anywhere! You can promote it in person if you’re in the US, or from your computer if you wish (like me). Start taking control of your life and your time. You can represent products you can believe in and feel passionate about because they contribute to better pet health. You get paid as much as you are willing to work for. Don’t be scared by the prices for the higher levels of reps! I signed up at the basic level, it’s perfectly OK to do that, and much more affordable to test the waters that way. You can always order more materials later, should you wish. If you’d like to talk to me about my experience as a rep, feel free to drop me an email!